This is an informal, unofficial summary of the reports and discussions during the semiannual meeting of the Board of Directors of the Dominican Development Group in Lake Charles, LA, on October 26, 2015. The formal minutes of this meeting will be available later. 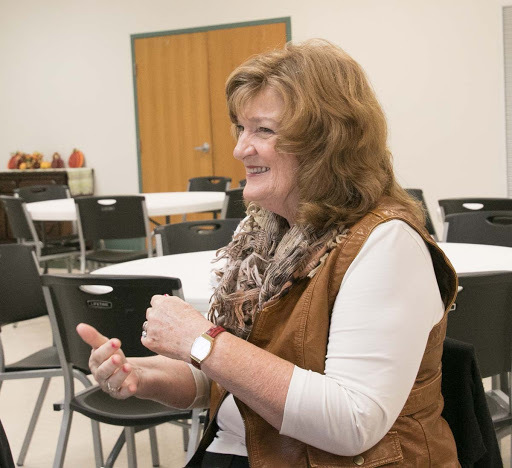 For an album of photographs from this meeting that also includes images from the DDG’s participation in the annual convention of the Diocese of Western Louisiana and visits to area churches, click here. 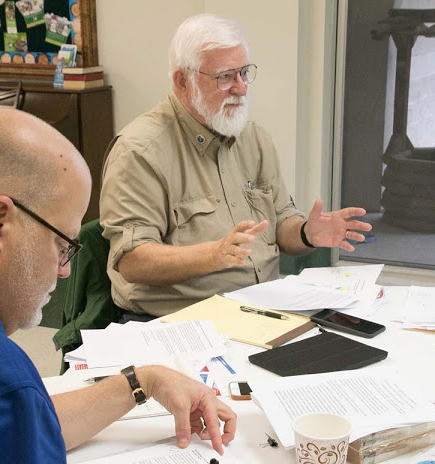 For a summary report of the activities of the DDG Board in the Diocese of Western Louisiana during this period, click here. 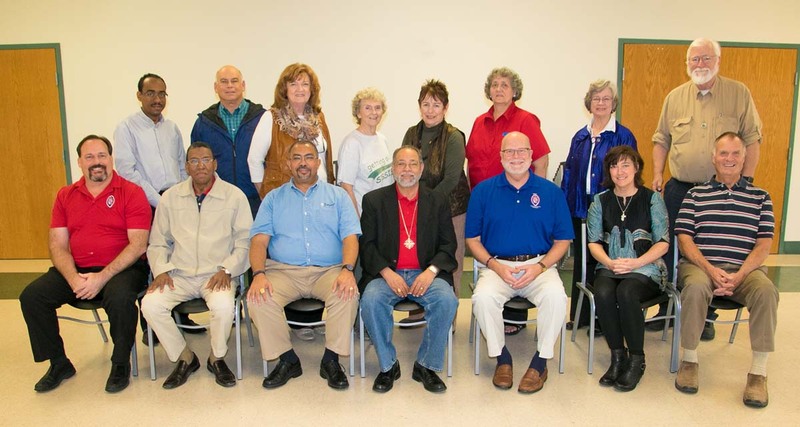 The members and visitors at the meeting of the Board of Directors of the Dominican Development Group at St Michael and All Angels Episcopal Church, Lake Charles, Louisiana, on October 26, 2015. Front row, from left: Bill Kunkle, Diocese of Southwest Florida and DDG Executive Director; The Rev. Moisés Quezada Mota, Bishop Coadjutor-Elect of the Diocese of the Dominican Republic; The Rt. Rev. Wendell Gibbs, Bishop of the Diocese of Michigan; The Rt. Rev. Julio C. Holguin, Bishop of the Diocese of the Dominican Republic and 1st Vice-President; The Rev. Deacon Beth Drew, Diocese of Western Michigan and Secretary; David Morrow, Diocese of Northwest Texas and President. Second row: The Rev. Deacon Alexander Romero, Diocese of the Dominican Republic; Paul White, Lay Episcopal Chaplain at McNeese State University, Lake Charles, Diocese of Western Louisiana; Karen Carroll, Missionary of The Episcopal Church, Diocese of the Dominican Republic; Harriet Green, veteran missioner, Diocese of Western Louisiana; Sally Thompson, Diocese of Southwest Florida; The Rev. Tar Drazdowski, Diocese of Nebraska; Julia Ariail, Diocese of Georgia; Julius Ariail, Diocese of Georgia. For more photographs from this event, click this image. The DDG board meeting in the parish hall of St. Michael's. For more photographs from this event, click this image. 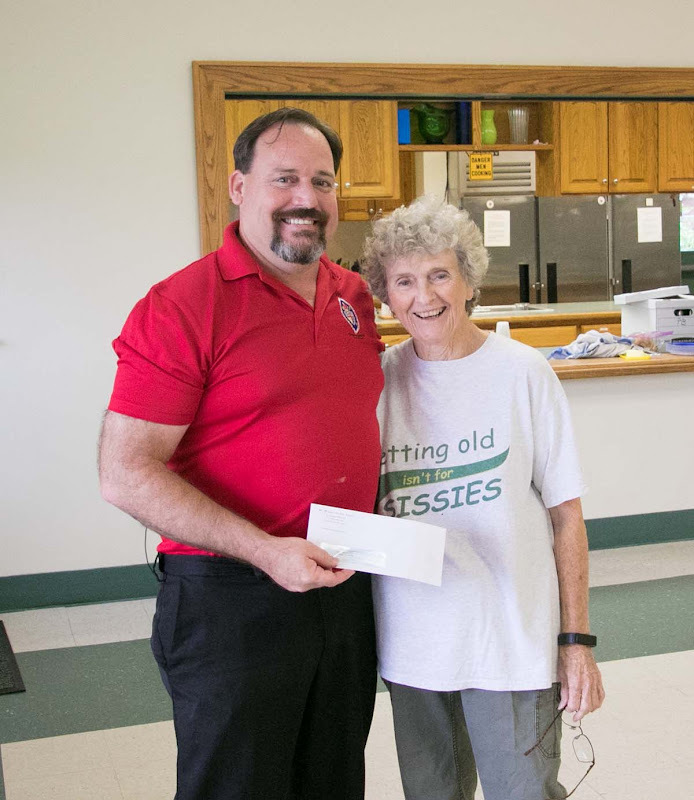 Dr. Harriet Green presented Executive Director Bill Kunkle with a donation for the DDG from St. Michael's. For more photographs from this event, click this image. St. Michael and All Angels Episcopal Church in Lake Charles, Louisiana, hosted the semiannual meeting of the Board of Directors of the Dominican Development Group in their parish hall on Monday, October 26, 2016. St. Michael’s is located in the Diocese of Western Louisiana, one of the dioceses with companion relationships with the Diocese of the Dominican Republic. Dr. Harriet Green and Paul White, veteran DR missioners and members of the St. Michael’s congregation, were the local liaisons to make arrangements for the meeting space and to provide lunch for the group. 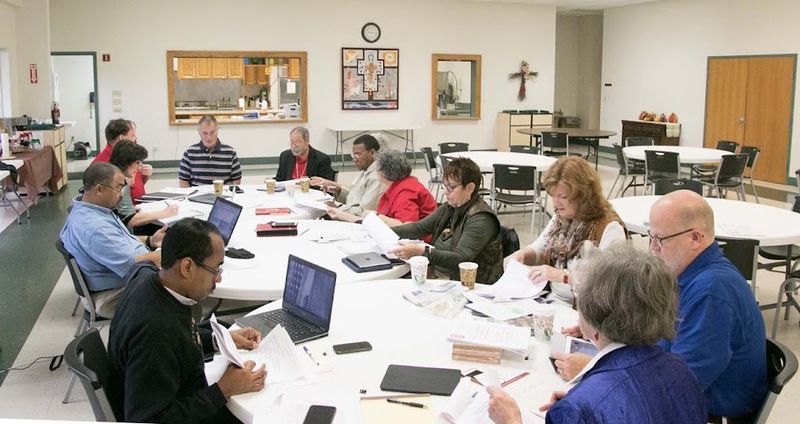 The board members expressed their gratitude to both Harriet and Paul for providing such a welcoming experience at St. Michael’s, including the services the previous day, the “Dominican Night” Sunday evening, and the opportunity to use the excellent facilities of the parish hall for the formal board meeting. President David Morrow during the DDG board meeting. Bishop Holguin is on the right. For more photographs from this event, click this image. Bishop Ousley gave the invocation. David called the meeting to order, announced that we have a quorum and invited the board members to introduce themselves for the benefit of the newly elected Bishop Coadjutor. Karen Carroll led the group in singing the Servant Song. The minutes of the previous meeting of February 16, 2015, were approved after corrections. Bill announced that a nominating committee will be formed so that we can elect new officers in February, 2016. President David Morrow and Treasurer Virginia Norman will be stepping down at this next meeting. David described the last six months as exciting times in the Dominican Episcopal Church. He worked with mission teams at Iglesia Episcopal San Simón Apóstol and attended the dedication of that church. There was an exploration team in April and the election of the Bishop Coadjutor in July. He and Bill have been working with another organization, Food for the Poor, to write grants for a project to build 100 houses in the next year or so. They are also interested in working to reestablish the greenhouses in El Pedregal as a food co-op for local residents. Bishop Holguin delivering his report. For more photographs from this event, click this image. Significant elements of Bishop Holguín’s report highlighted the three special conventions held in March, April and July, 2015. The first two were to make revisions to the diocesan Constitution and Canons. The third was to elect the Bishop Coadjutor. The Episcopal Church (TEC) in New York has transferred $949,965 to the Diocese of the Dominican Republic to contribute to the diocese’s Fund for Self Sustainability (FOCA). He outlined the decrease of TEC funds that will end totally in 2024. Nineteen priests and deacons moved to new assignments in August. A new missionary from Colombia, the Rev. Diego Fernando Sabogal, will be serving with the Very Rev. Ashton Brooks at the Cathedral of the Epiphany as well as at the seminary. The Rev. Buddelov Adolfo Moronto has transferred to another diocese in the United States. Bishop Ousley expressed concern about the drain on Dominican clergy resources with these clerical transfers to the US. He asked how he and other bishops could support the system of accountability and cooperation between bishops concerning this issue. Thanks to the help of many missioners, Bishop Holguín dedicated two new mission churches in July and October. Three others are scheduled for November and December. Bishop Holguín described the process of financial sustainability using the TEC money and the expected campaign for self-sustainability we hope to begin next year. His printed report showed a graph with financial data from the years 1990, 2000, 2015 and 2016 (projected). In 1990 TEC provided 85.6% of the DR Diocesan budget. In 2016, they will provide 8.3%. These figures are even more impressive given that the budget has more than tripled and the number of Dominican Episcopal churches has doubled. Missionary Karen Carroll. For more photographs from this event, click this image. Part 2 of the business meeting began with more songs: Alabaré, Here I am Lord, and I, the Lord of Sea and Sky. Karen then gave the Mission Team Office Report. Fifty-two mission teams came to the DR in calendar year 2015. There were 10 medical, 10 Vacation Bible School, and 32 construction teams. There were also a number of unique activities including a sewing, knitting and crochet project for women, several water projects, aid to community homes with construction and a solar energy program. Shoes, underwear, books and prayer books have also been donated. A Georgia team held an eye clinic in San Pedro de Marcorís for approximately 1,000 people and provided them with both prescription and non-prescription glasses. Some people donated financial help for Haitians to obtain documentation. The University of Nebraska is planning to place students in homes and have them teach English for a semester next year. There were two exploratory trips that produced at least 3 new teams. Emily Gibson, a volunteer from Charleston, S.C., spent 8 months working with mission teams and writing the histories of churches. We have a new volunteer, Hannah Jensen from Hastings, Nebraska, for 3 months. She is teaching music to seminarians and starting a music program in Iglesia Episcopal Santísima Trinidad. The program will continue with instructors paid by a Dominican foundation after she leaves. Patricia Martin and Charlie Nakash are invaluable assistants to teams. Individuals and churches funded 290 scholarships to our Episcopal schools this year. Karen continues to look for a potential successor for her position to take her place when she decides to conclude her work in the Dominican Republic. 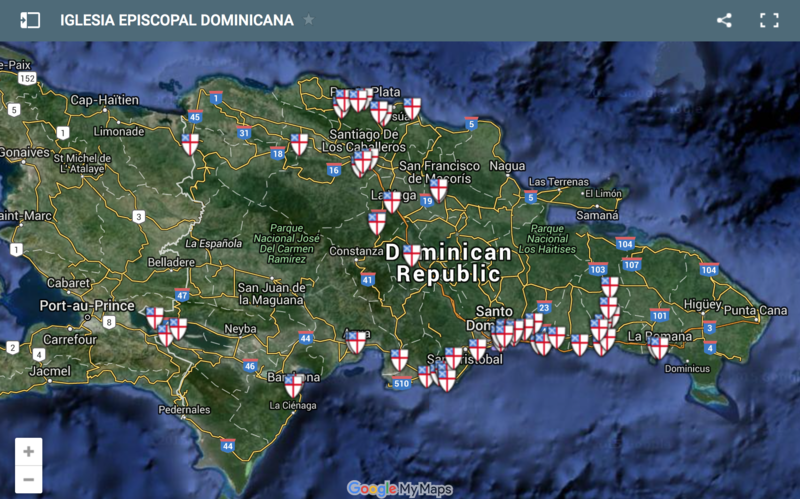 The new interactive map of the facilities of the Diocese of the Dominican Republic. To access this map, click this image. Julius delivering his report. For more photographs from this event, click this image. Julius gave the communications committee report. He described the Map Project success with identifying the exact locations of all of the churches, schools, conference centers and dormitories, the daycare centers, clinics and nursing homes owned by the Dominican Episcopal Church. There is an interactive map for all locations on both the DDG and Dominican diocesan websites. We have published a trifold brochure with GPS location data that will be displayed on the websites and included in packets given to mission teams. He has submitted the names and locations of Iglepidom facilities to the editors of Google Maps. They are appearing gradually. We have also shared this map data with TEC and made preparations to share it with TEC’s Map Asset project as soon as that project is opened up to Province IX dioceses. In addition, he re-designed the Iglepidom website, updated its content, improved its security, and moved it to a new host server. He also transferred the registration for the domain name to the Iglepidom Treasurer with an extended registration for ten years. He began the design for the CET seminary website and is ready to add content as soon as it is available. The DDG website published 22 articles, the current incoming mission team list, and information following the election of the Bishop Coadjutor. Since February 1, 2015, the website has been visited 5,878 times with a total number of 9,704 page views. In the publications section, he added the five new church histories written by Emily Gibson. Julius posts new content on the DDG Facebook page daily with a focus on the work of mission teams. There has been an increase of Facebook page “likes” from 556 to 651. The number of Twitter followers increased to 40 from 28. Julius created DDG Companion News, a new monthly newsletter that began in March 2015. The latest fourteen-page issue of Compañeros Dominicanos was published in September. These two newsletters are distributed by email with additional posts on DDG Facebook and Twitter. Bill delivering his report. For more photographs from this event, click this image. Bill began his report by thanking Julius and Julia for their work on the website, map project and other social media resources. The group gave them a standing ovation. Bill described the recent purchase of an ambulance and a Honda Pilot that are being sent by ship to the DR. Virginia Norman’s biography by Dr. Vickie Hall Stevens and Susan Guise is on sale for 250 pesos in the DR and $10 in America. Bill is taking orders and hopes the Bishops will buy several copies to distribute in their dioceses. For ordering information, click here. After lunch, Bill continued his report. He described his work with mission teams: the solar energy projects, the water and sanitary latrine program, exploration teams in April and November, the Clinic Esperanza, vocational schools and the endowment. He travels extensively – 88 days away from home in 2014 and 101 in 2015. There are 6 active grants. 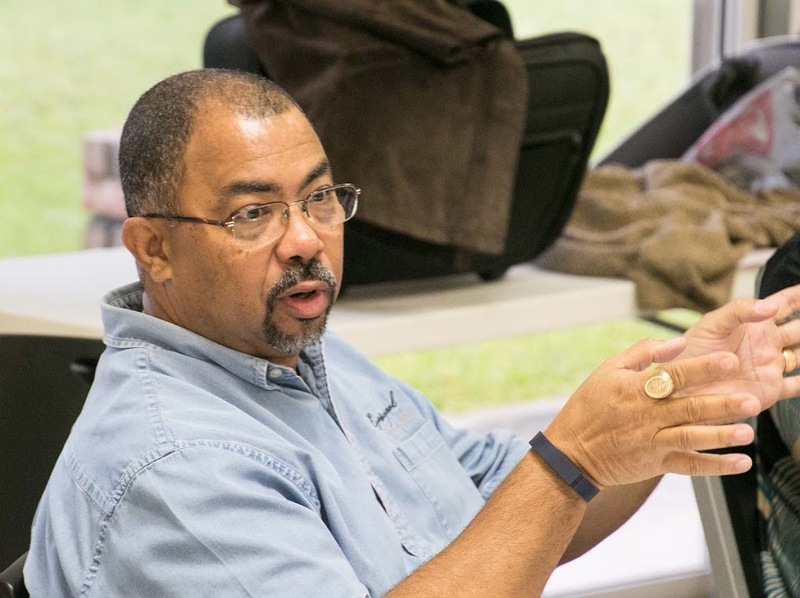 Bill is now on the board of the Global Episcopal Mission Network (GEMN). 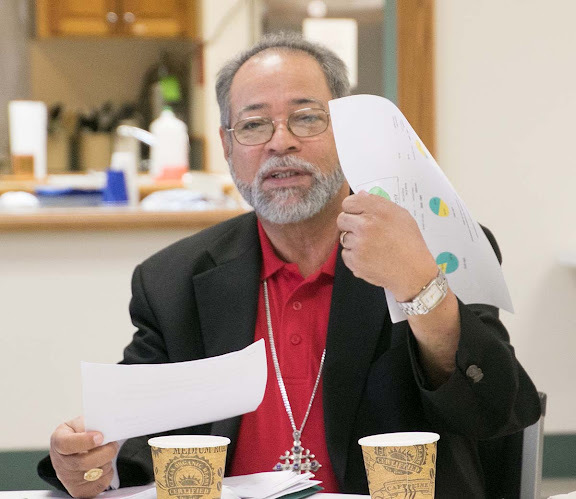 He recently hosted a meeting of the GEMN directors in Tampa and will travel to Puerto Rico next May to the GEMN annual conference that will be attended by the new Presiding Bishop and many other leaders of the Episcopal Church and allied organizations. 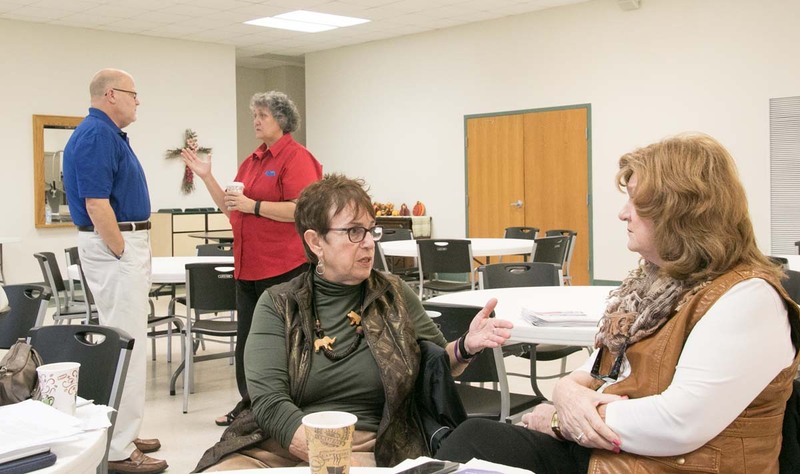 From left: Board members Bishop Ousley, Mother Drazdowski, Sally Thompson, and Karen Carroll during the lunch break. For more photographs from this event, click this image. Bill said that he hopes to strengthen the relationship between the DDG and the Diocese of Southeast Florida. He also hopes to develop relationships with other dioceses that support mission teams in the DR but so far have not been DDG members. Bill then discussed the budgets of the DDG for 2015 and 2016 (proposed). The DDG has a budget shortfall of approximately $15,000 this year. 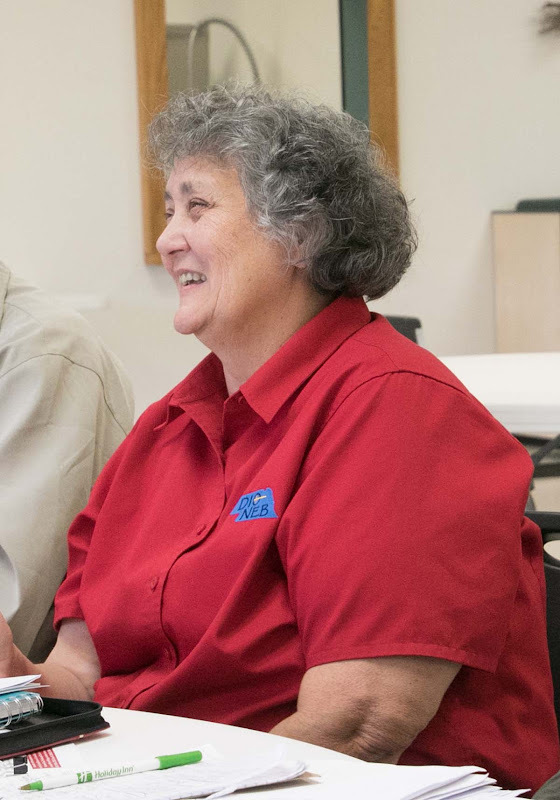 Several companion dioceses have not sent in their yearly donations. He encouraged all the representatives to contact the bishops to send their money. Bishop Holguín proposed asking $12,000 from Companion dioceses rather than $10,000. Bishop Ousley reporting on the Endowment campaign. For more photographs from this event, click this image. After the break, there was an open discussion with the committees. Bishop Ousley reported that the Endowment campaign is moving slowly but steadily. 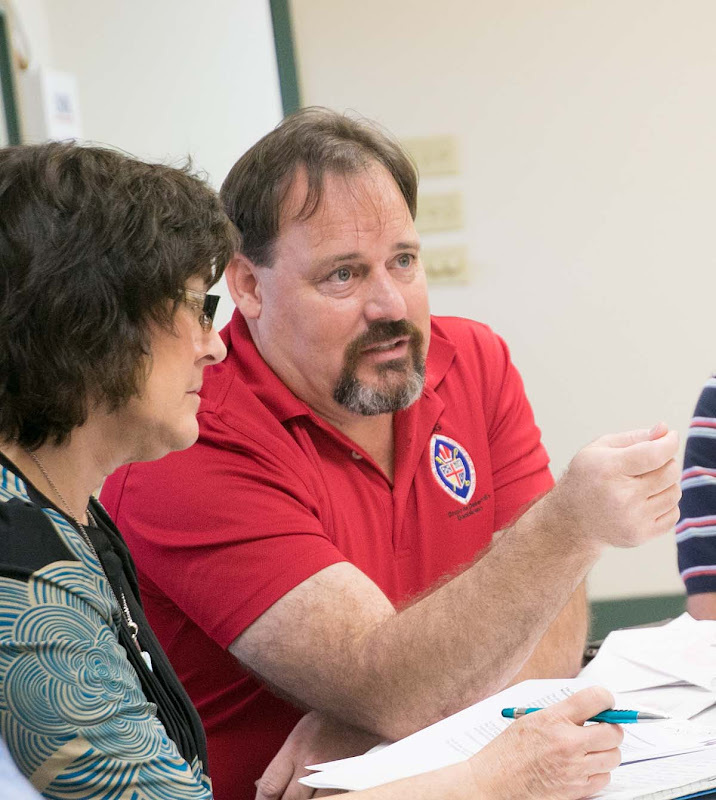 We are acquiring pieces of information for The Episcopal Church Foundation from the Dominican diocesan office as well as from the Companion Dioceses. January 1 will be a possible soft start to the campaign. Julius attended a fundraising seminar in Atlanta recently and a webinar online. His advice is for us to learn to tell our story, and always start with why we support the DR, not what we do to support the DR. We always need to emphasize our relationship as two-way partners, not as one-way donors. We will clarify the target amount to be raised and identify someone with stature and visibility to serve as the chair for the Endowment campaign. Mother Tar. For more photographs from this event, click this image. Mother Tar spoke about the Latrine and Clean Water project. Bill has a budget of $45,000 sent to St. Mary’s (Kinston, NC) for the Mosovi water project. The Latrine project will kick off with a multi-diocesan team from April 14 – 20, 2016, to train people to use the forms. We hope to have those trainees to lead teams in the future to make and install more latrines. The forms are in Consuelo. The team will be housed in the Kellogg Center. 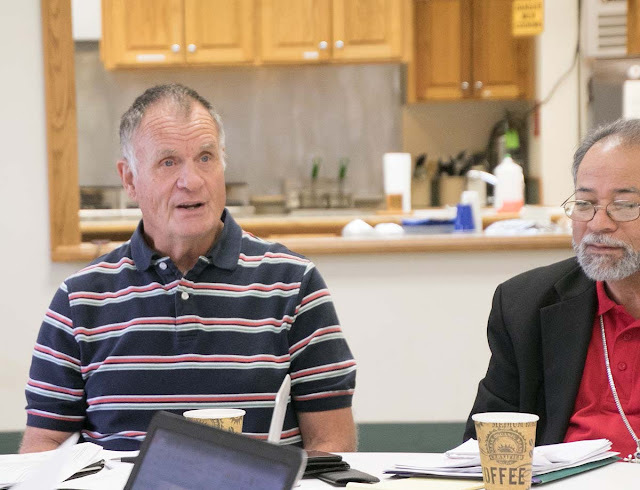 Concerning the DDG budget, Bishop Ousley recommended a 2% salary increase for Bill Kunkle with accompanied 2% increases in tax liability and pension, a $2,500 increase in local travel expenses and a $5,000 increase for project and program related expenses. The second and third items were intended to address additional expenses that have previously been paid personally by the Executive Director because funds were unavailable for the designated programs/projects. Let’s aim for collecting an additional $25,000-$30,000 so that he can hire a half-time assistant. Bishop Holguín suggested the chairperson of the endowment committee write a letter of appeal to all the Episcopal bishops asking for a donation of $500 – $1,000 from their discretionary funds to show universal support in the House of Bishops for the endowment compaign. David described the One Hundred Homes Project. In the next several years, the DDG in conjunction with the Diocese of the Dominican Republic hopes to build 100 homes at $10,000 per unit, or less if the owner owns land. There are certain standards to be upheld if we collaborate with the Food for the Poor organization. In December, David and Bill will take the executives of that organization to Jarabacoa to show them the houses built by Christ Church (Valdosta, GA) and the Nebraska Youth Team in 2014 and 2015. Bishop Gibbs during the discussion. For more photographs from this event, click this image. Karen announced that 38 teams have already signed up for trips in 2016. 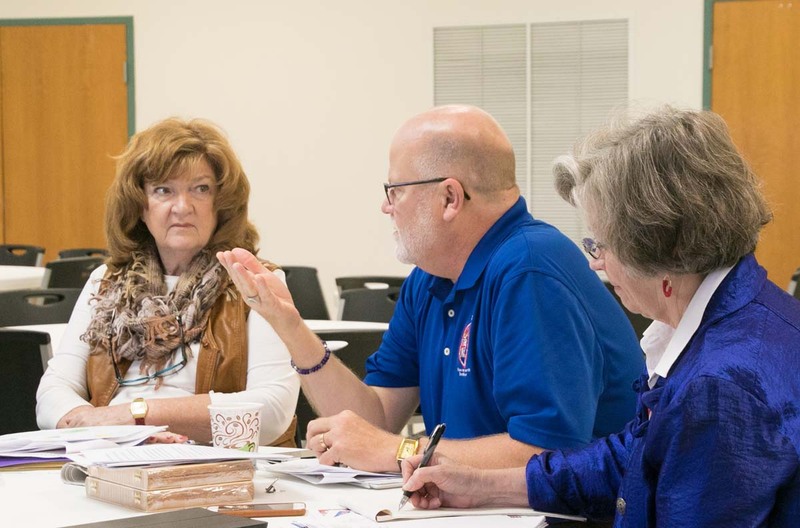 There was an open discussion during which the board members described mission team plans for their dioceses in the upcoming year. The next meeting of the DDG board is scheduled for Monday, February 15, 2016, in Santo Domingo. The consecration of the Rev. Quezada as Bishop Coadjutor of the Diocese of the Dominican Republic is scheduled for Saturday, February 13, 2016, in a location in Santo Domingo. This historic event will conclude the annual convention of the Diocese of the Dominican Republic. The location and date of the board meeting in the fall of 2016 will be decided and announced later. The meeting adjourned at 4 p.m. The board members then enjoyed supper at a local restaurant in Lake Charles, and departed to their home stations on October 27. Please note: these are not the official minutes of this meeting. This report is informal, unofficial, and intended only to covey the general topics discussed and actions taken at this meeting. Reports distributed at this meeting are attached below.